Although we all need to be vigilant when it comes to the sun, research has revealed that men over the age of 50 are at the highest risk of developing melanoma, the most dangerous form of skin cancer. In men, the disease appears typically on the back, head and neck, in areas hard to spot, contributing to a later diagnosis than in women, making their condition harder to treat. As the risk is higher in those who spend lots of time outdoors in spring and summer, it makes sense that gardeners should be aware of the dangers. The Watch Your Back campaign, spear-headed by Charlie Dimmock and Alan Titchmarsh and supported by The Garden Centre Association, The Professional Gardeners Guild and The National Allotment Society, have got behind the campaign to urge men to review their sun protection habits and get their backs checked regularly for the warning signs of skin cancer. "Gardening is a wonderful pastime and getting active outdoors is a positively healthy thing to do any age", says Charlie Dimmock. "However, we ALL need to be more aware of the dangers of the sun. Men especially can be reluctant when it comes to applying sunscreen, visiting their doctor or checking their skin for signs of change. With this attitude, not only do we risk melanoma, but all other sun-related cancers". 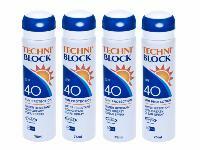 Techniblock SPF40 Sunscreen, recently featured in ProLandscaper, offers lightweight, non-greasy protection for up to 6 hours. Oil and fragrance-free, it is very resistant to water and perspiration, providing an invisible barrier against harmful UV rays. An aerosol spray that dries instantly on the skin, Techniblock allows the skin to breathe, thus reducing the symptoms of prickly heat. Available in a range of SPFs from 30-50+ and a range of different size cans from 75ml to 340ml, ProLandscaper identified it as being the best value for money when compared to Ultrasun, P20 and Dermalogica. Men can be guilty of believing we don't need to worry about sun protection, especially when we hit a certain age", says Alan Titchmarsh. "However, this appears to be the furthest thing from the truth. Melanoma is a terrible disease and it can destroy lives, but it is avoidable. Protect yourself and you lessen the risk of all types of skin-related problems". So, get outdoors, have fun, enjoy gardening, whether it's for pleasure or business, but stay protected in the sun.